Cooking for friends or family? Delight their taste buds with our Laxmi Ajwan Seeds! Our variety of authentic Indian spices and cooking ingredients are just what you need to create a gourmet meal in your kitchen. House of Spices carries the essential ingredients that will allow you to create a home-cooked sensational dish that always please. Laxmi Ajwain Seeds are commonly known as oregano seeds. Used as a digestive, chewn by themselves or with a little sugar to make it more palatable in its raw form. House of Spices is a leader in the market of classic Indian cooking spices. Proudly distributed throughout the United States, House of Spices specializes in exceptional spices and food products always sourced from the highest quality ingredients. House of Spices has the ingredients you need for traditional Indian cooking - made pure, made fresh, and made wholesome! 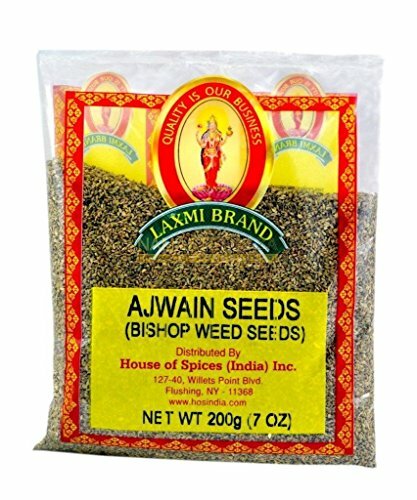 Laxmi Ajwan Seeds are also known as carom and have a bitter, pungent taste with notes of anise and oregano. Laxmi Ajwain Seeds can also be used as a cure for diarrhea, dysentery and indigestion. House of Spices Ajwan Seeds are an all natural food product that is guaranteed fresh. Our Ajwan Seeds are of the highest quality and will be a delightful addition to any meal. Our 7oz Ajwan Seeds are conveniently sized for home cooking! House of Spices has all of the Traditional Indian Spices and food products you need to get cooking. At House of Spices, spreading Indian food culture through quality products and family recipes is our company goal! Our authentic Indian Cooking spices are of the best quality and will bring intense flavor and vitality to your dinner table. Whether you're looking for traditional Indian spices and food products to create an exotic dinner, or simply wanting to indulge your nostalgia and make a dinner with all of the familiar flavors of home, House of Spices has the ingredients you need! If you have any questions about this product by Laxmi, contact us by completing and submitting the form below. If you are looking for a specif part number, please include it with your message.